When my DS started teething, I began researching teethers. Since the lead scare last year, I am much more wary of what I buy and what my kids put into their mouths. As I was doing my research one teether kept coming up over an over and over with amazing reviews. Honestly, I was skeptical. I was used to the teethers you buy in the drug store (the ones filled with water) that cost just a few dollars. This was significantly more and I couldn't imagine what makes a teether worth the price. However, when I kept seeing incredible reviews I decided to splurge. Boy was it a worthwhile investment!! 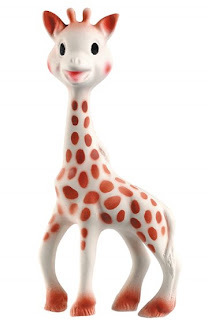 A French classic, Sophie the Giraffe is hand-painted with food grade paints and made of natural rubber in the French Alps so there is no fear of lead, BPA or any other harmful products that are commonly found in todays toys. Her company, Vulli, is relatively small, but has been manufacturing Sophie the same way for over 40 years. Because Sophie is soft, light and easy to grasp, my DS had an easy time getting her to his mouth. She is pefect for little hands and makes a happy sound when squeezed. He especially loved gnawing at her bumpy head and long, thin legs. He just kept chomping and chomping and chomping. It goes everywhere with us!! I keep an extra one in my diaper bag! I love it because I don't have to worry about what is going into his mouth.